how about this partridge family episode where keith makes a film about his family here he is operating a bolex. but what kind of editor was he using can anyone tell? It looks like it could be a Bolex V180 editor. Last night my film club screened a great tribute to silent films; Days of Thrills and Laughter with many thrilling and hilarious scenes. 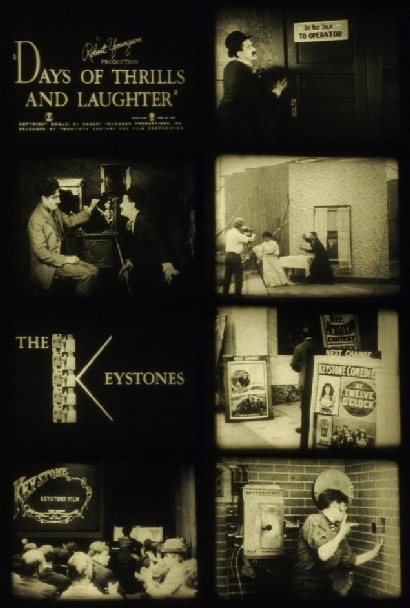 Here is Snub Pollard, waking up the projectionist running the film way to slowly, an early Pathé serial being filmed with a hand-cranked camera, a clever title with projected images making up a letter "K", and Mack Sennett taking in a Keystone comedy with Fatty Arbuckle while the projectionist pantomimes what he sees in the theater, Sennett shooting at the villain on screen. This looks so cool Gerald. What a treat! It's a great film, with many scenes from some of the better moments in silent film...not all though. I can not express how exciting it is to see an excerpt of 'Play Safe' with Monty Banks among other treats in that film. It's a very sharp print and one defiantly worth having! 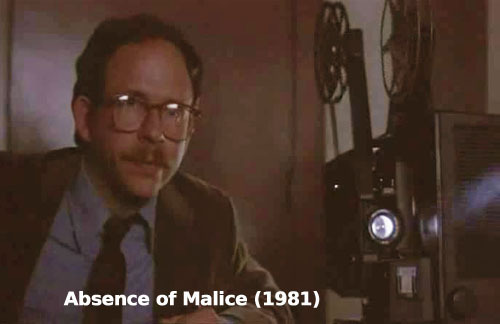 Directed by the late Sydney Pollack, Absence of Malice (1981) stars Paul Newman, Sally Field, and one of my favorite character actors Bob Balaban (pictured with projector below). 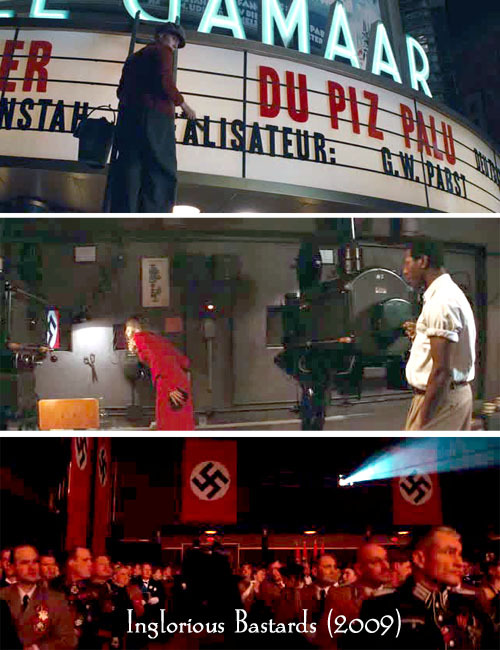 And a similar link: "Marquees in Movies" ist a collection of screenshots from movies showing movie theaters and their marquees. Nice links Joerg...You must have been reading my mind. 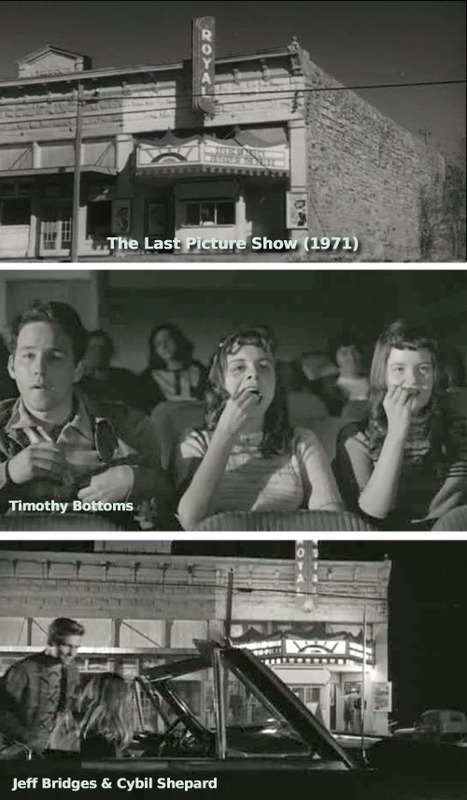 Here was the next set of movie captures I had ready to post for The Last Picture Show (1971). Jeff Bridges was just a kid in this film and so was Moonlighting's Cybill Shepard. "Ladies and gentlemen, bow to His Highness of public domain cartoons leftover from the Great Depression!" 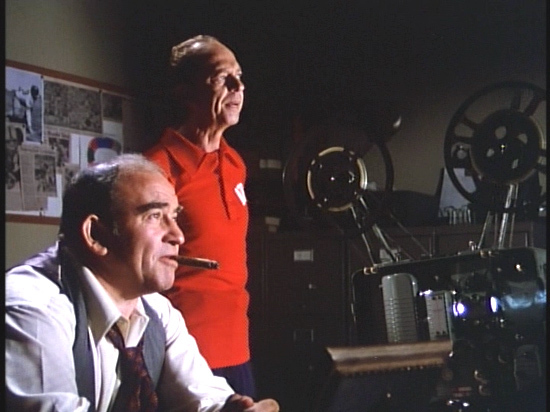 Gerald, something does not look right with that projector. The top reel appears to be out of alignment. I've no idea what it is, but I'd guess that it's 1950s-era, probably not a Bell & Howell which were those noisy, encased beasts. 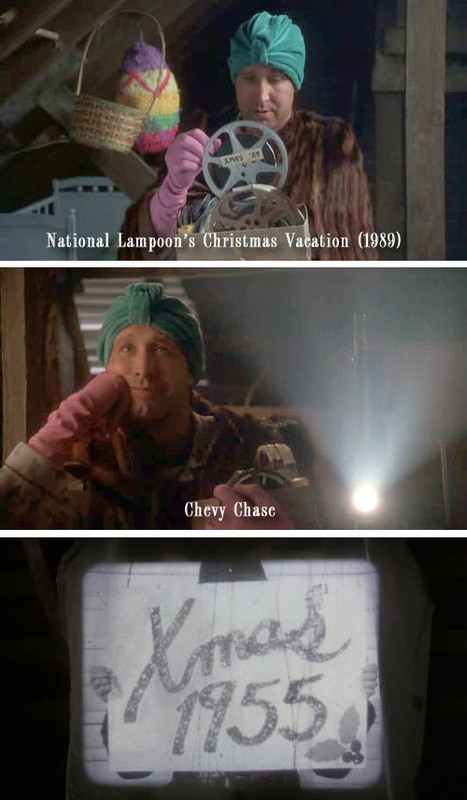 In keeping with the Christmas spirit...Today I was watching National Lampoon's: Christmas Vacation (1989) and ran across this scene where Clark stumbles upon some old 8mm family movies in his attic. Here is a happy days episode where Postie and Ralph want to borrow Ritchie’s dads projector but a burglar has different plans. Looks like a bell & howell. I'm sure they'll be watching films starring Will Heeey (Hay) - best said whilst giving the thumbs up! Interesting considering Ron Howard was very involved in Super-8 filmmaking in his teenage years. -did they have those colorful plastic reels back in the 1950s? Janice I had a 256 B&H years ago I assume its a B&H not sure of the model. 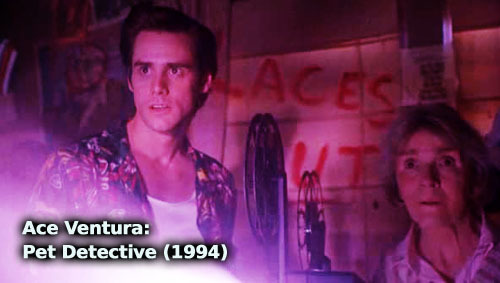 Here's a clip from Ace Ventura: Pet Detective (1994) Ace (Jim Carry) and Mrs. Finkle (Alice Drummond) as they look at football footage of Ray Finkle missing a field goal kick in the Superbowl. The scene starts at 11 min. 23 sec. in this youtube link. The Big Premiere OUR GANG #189 where the kids make their own movie and premiere. The gang's film-within-a-film is called "The Mysteeryus Mistry." The Brady Bunch episode 4 season 2 The Un-Underground Movie. add another one to the list. Watching a movie on TBS this morning I saw a group of people in a meeting room watching a S8mm film production about a train ride...it was made to look very boring...The Station Agent was the title. 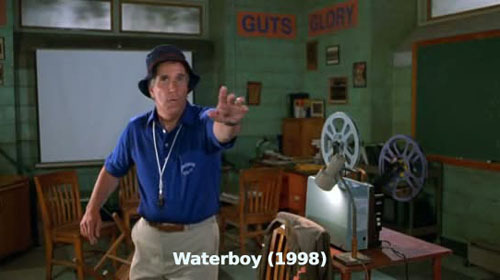 In this scene from The Waterboy (1998) Coach Klein (Henry Winkler) reacts to Bobby Boucher (Adam Sandler) walking into the room while he's looking at football films. I don't have a clue to what make and model of projector. 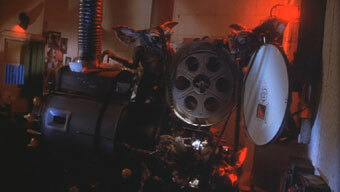 someone refresh my memory, did they use projectors in any of the Porky's movies or just hold reels of film in a few scenes? Janice, That looks like another Bell &Howell mystery model. 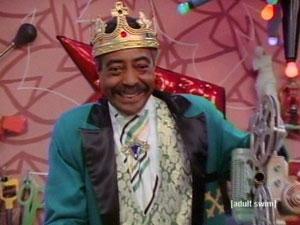 Wayne, My dad took me to see Porky's when I was 7 years old! The trailer for it is available on Super 8, I wonder if the feature ever made into a Super 8 optical sound airline print? Inglorious Bastards (2009) is such a good movie on so many levels. No spoiler alert here just that the cinema plays a pivotal part in the film. Janice, that's a 1500-series B&H -- we used to see a lot of those green beasts at school -- which is the same one in Joerg's picture from Super 8.